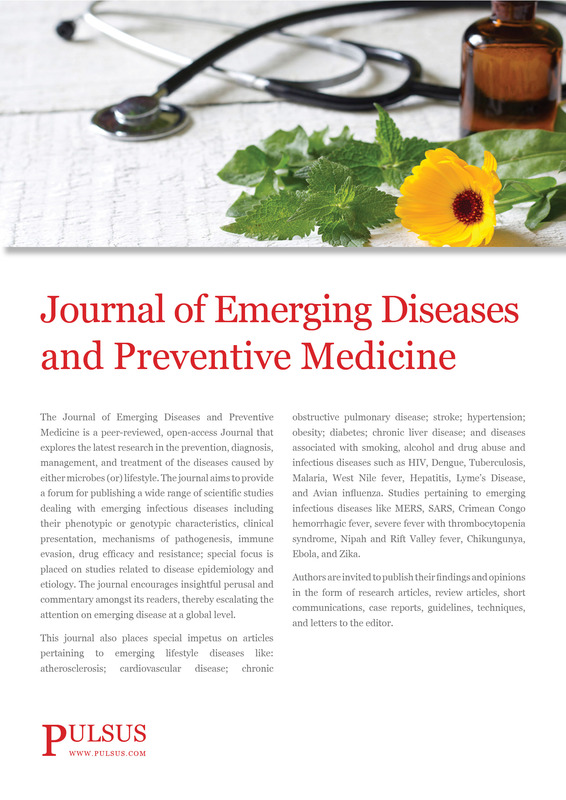 The Journal of Emerging Diseases and Preventive Medicine is a peer-reviewed, open-access Journal that explores the latest research in the prevention, diagnosis, management, and treatment of the diseases caused by either microbes (or) lifestyle. The journal aims to provide a forum for publishing a wide range of scientific studies dealing with emerging infectious diseases including their phenotypic or genotypic characteristics, clinical presentation, mechanisms of pathogenesis, immune evasion, drug efficacy and resistance; special focus is placed on studies related to disease epidemiology and etiology. The journal encourages insightful perusal and commentary amongst its readers, thereby escalating the attention on emerging disease at a global level. This journal also places special impetus on articles pertaining to emerging lifestyle diseases like: atherosclerosis; cardiovascular disease; chronic obstructive pulmonary disease; stroke; hypertension; obesity; diabetes; chronic liver disease; and diseases associated with smoking, alcohol and drug abuse and infectious diseases such as HIV, Dengue, Tuberculosis, Malaria, West Nile fever, Hepatitis, Lyme’s Disease, and Avian influenza. Studies pertaining to emerging infectious diseases like MERS, SARS, Crimean Congo hemorrhagic fever, severe fever with thrombocytopenia syndrome, Nipah and Rift Valley fever, Chikungunya, Ebola, and Zika.